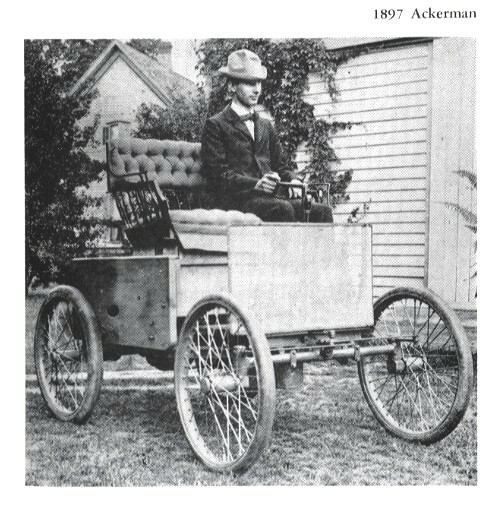 W. K. Ackerman of Detroit, Mi built this American Automobile in 1897. Passenger comfort was Ackerman’s first goal. He was not concerned with how to propel his automobile, but how to give it greater riding ease. Passenger comfort was a problem to be solved in the late 1800s.W. K. Ackerman did this with three separate features. The feature attraction of the shown below was the «Ackerman Spring Wheel.» All forms of leaf or coil springs had been eliminated. The new arrangement consisted of a wheel hub and steering knuckle that had internal springs.